Former Gov. Rod Blagojevich was convicted of lying to the FBI, but the jury deadlocked on the other 23 counts. Chicago, Illinois (CNN) -- Prosecutors have dismissed all four charges against Robert Blagojevich, brother of former Illinois Gov. 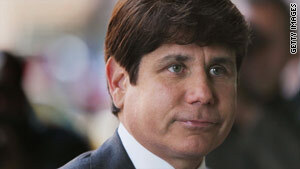 Rod Blagojevich, defense attorney Michael Ettinger said Thursday. "I was in shock and still am," Ettinger said. He said that when he told his client, Robert Blagojevich said, " 'Oh, my God; oh, my God.' And I told him, 'You're done. You're free.' His wife is hysterical." Ettinger said prosecutors told a judge at a hearing Thursday that they were dropping the charges because of "the disparity in the roles between Robert and Rod" and "in the interests of justice." On August 17, after deliberating for 14 days, a jury in a federal corruption trial convicted Rod Blagojevich of lying to the FBI but said they were deadlocked on the other 23 counts against the former governor as well as the four against Robert Blagojevich. Prosecutors have vowed to retry Rod Blagojevich, who faced charges including racketeering, wire fraud, attempted extortion and bribery. The two-term Democrat was removed from office in January 2009 amid accusations that he attempted to sell the U.S. Senate seat that Barack Obama held before he was elected president. The former governor will be retried after the first of 2011, said his lead attorney, Samuel Adam Sr.
Adam indicated that he is not happy at the limit placed on the number of federally funded attorneys on Blagojevich's legal team. Blagojevich qualifies for a public defender, U.S. District Judge James Zagel said, and he will appoint two attorneys and possibly a paralegal, according to CNN affiliate WGN. A pro bono attorney is allowed, but Blagojevich must disclose the source of the funds if he has any paid representation, Zagel said, according to WGN. The last trial was funded with nearly $3 million in campaign money. "You saw what happened in court. We're now down one defendant, one less charge, and we're down about eight lawyers," Adam said. He said he thought Zagel was wrong to say he could appoint only two attorneys. Attorneys in the case have gone through piles of papers and listened to hours of taped conversations. "We have millions of documents to go over. We had 20 people working full-time on this case," he said. Adam said his next step will be to sit down with the former governor and "decide what is best for him. ... That's the only question that is important." Defense attorney Sheldon Sorosky said prosecutors should now dismiss the case against Rod Blagojevich. Adam said it could still happen, noting, "The government has done some strange things in this case already." The former governor "is innocent of any crime," Adam said. "You've got to keep that in mind." He said he is open to discussions with prosecutors, but has not been approached. Adam said he had not spoken to Blagojevich and didn't know what his reaction would be to prosecutors dropping charges against his brother. Robert Blagojevich was charged with one count of wire fraud, one count of extortion conspiracy, one count of attempted extortion, and one count of bribery conspiracy. Asked why prosecutors dismissed charges against Robert Blagojevich, Ettinger said, "I didn't ask, but I'm not going to argue with them." "What he's been through, and what he thought he was going to go through again, and then out of nowhere, they dismiss the charges ... I've been doing this a long time, and things like this don't happen," the attorney said. But "the evidence was far from great against him," Ettinger said. "I'm sure they know the jury was 9-3 for acquittal." He said he was told that six women on the jury refused to convict Robert Blagojevich in any circumstances. He said Robert Blagojevich could be subpoenaed in his brother's retrial. During the first trial, Robert Blagojevich testified his brother was "trying to politically work something to his benefit" in handling the Senate appointment, but was thinking in terms of political horse-trading, not corruption. In a conversation recorded by federal agents, the then-governor told an aide, "I've got this thing, and it's [expletive] golden. I'm just not giving it up for [expletive] nothing." "It didn't seem out of the ordinary, because Obama was taking a lot of people from Illinois with him to D.C.," said Robert Blagojevich, who raised money for his brother. He said his brother "was interested in the idea of being the head of Health and Human Services." While awaiting trial, the ousted governor repeatedly asserted his innocence in interviews and on Twitter, as well as during his appearances on the "Celebrity Apprentice" reality show."